Thanks to poet Mary Cresswell, who has done a bit of sleuthing, I can add a postscript to my post about Poetry & Gender in NZ Publishing. Mary has looked at all the poetry books published in New Zealand over the 5 years 2008-2012 and noted which ethnicity the poets identify with, based mainly on their author/publisher webpages. So it may not be 100% accurate, but I think it’s a good estimate. Apologies for the poor quality of the graph below – there’s a clearer version if you click on the link underneath it. What it shows is that, over the five year period, 90% of the poetry publishing pie went to Pākehā/European poets, 4% to Pasifika poets, 3% to Māori poets and 2% to Asian poets. 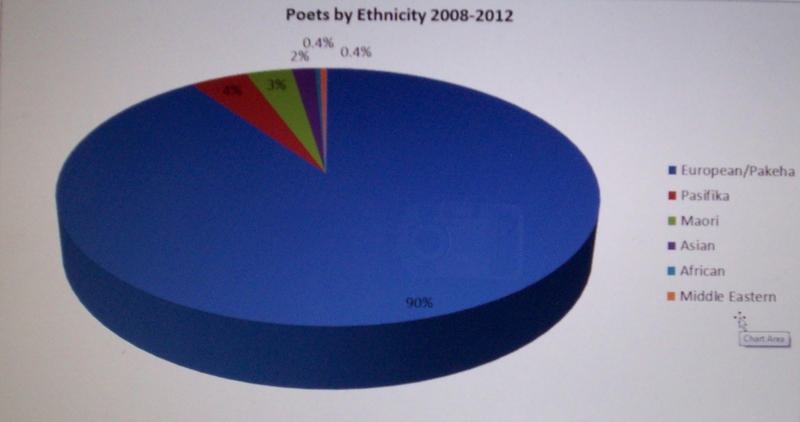 Middle Eastern and African poets accounted for 0.4% of books respectively. When you compare this to proportions in the New Zealand population (70% Pākehā; 14% Māori; 11% Asian, 7% Pasifika and 1% Middle Eastern/Latin American/African – figures from Stats NZ Census 2013) it’s not looking very representative. I do think it’s important for a country’s literature to reflect the diversity of voices in its population. In a comment on the ‘Poetry and Gender’ post, Tina Makereti said that her research for her PhD “also identified a lack of any real indigenous literary studies in New Zealand (no courses at tertiary level, limited commitment to indigenous literatures in high schools), and few Māori literature scholars. I think if the commitment were there from the universities, and Māori saw themselves represented in the study of literature, the numbers would increase.” So – universities, high schools, publishers – over to you! PS: I should have mentioned that, as with the ‘Poetry & Gender’ data, the source for titles and authors, etc is The Journal of Commonwealth Literature and I’m grateful to Rebecca Pilcher for providing the 2012 information. I wonder what the stats would be for Lesbian and Gay poets? I love poetry, but I have to leave a lot of stuff on the shelf because it’s so hetero-normative. I had to wonder why I was reading poetry when I was reading a poem by a SWM (and it is usually a SWM that engages in this behaviour) about comparing autumn evening to a woman’s body shape. If he was comparing autumn to a beautiful hunky man, then I’d be all ears! But Christopher, I love Carol Anne Duffy’s poems and I’m heterosexual. It doesn’t matter a jot to me that she’s addressing another woman. Christopher, I wonder if you’ve read ‘When two men embrace’? It was the gay men’s volume of ‘The New Zealand anthology of gay and lesbian poetry’, published in 1999, the lesbian volume of which was ‘Eat These Sweet Words’. Not sure it would still be available to buy but some libraries have it. (The first poems I ever had published were in ‘Eat These Sweet Words’, although these days I would no longer qualify.) Oh and there’s also David Lyndon Brown’s ‘Skin Hunger’. @Linda, that’s great that you as a heterosexual woman can appreciate Duffy’s ‘lesbian’ poems. It’s kinda like the ‘my best friend is a lesbian’ line. Yes, and? @Janis – yes I have read When Two Men Embrace, and have spoken to David Herkt and Michael G. I’m just wondering why there’s not more gay NZ poetry. I can trace a line from Brasch (In your Presence: A song cycle), then Sargeson’s Coal Flat, even though that’s not poetry, skip the 60s and 70s and much of the 80s – nothing there – it’s a wasteland in terms of gay poetry. I have a project, long term, to see if I can put together some kind of timeline starting with Brasch. Forget ethnicity.It is the universality of human expression and insight we should be going for and this should be regardless of ethnicity, gender, religion and nationality. That some New Zealanders still think in ethnic terms,is a manifestation of neocolonialism as a mindset along with its racialist implications anchored in the nether regions of the New Zealand psyche, hence the irrelevance of demography as a tool for determining the validity and value of literature.So what if the stock of poetic expression is unevenly distributed, something that is of importance to the banal minds of demographers, accountants and engineers?.It is not the diffusion of the ideas but nature, validity and authenticity of the ideas that really counts along with the artfulness and soulfulness, and musicality with which those ideas, emotions and sentiments are expressed that really counts..We need to ask how representative of human culture is New Zealand poetry not how representative of the population the poets are? without the intervention of numeracy, slide rules, and calculators as tools, ( a truly gradgring and benthamite approach to poetic literacy.let us not also forget that the sum total of New Zeland experience comes nowhere near to the experience of humanity in all its manifestations, so dont confine yourselves to new Zealand poets and poetry. without the intervention of numeracy, slide rules, and calculators as tools, ( a truly Gradgrind and Benthamite approach to poetic literacy.Let us not also forget that the sum total of New Zealand experience comes nowhere near to the experience of humanity in all its manifestations, so dont confine yourselves to new Zealand poets and poetry. @aotearoa5461 I’ll happily forget ethnicity when Maori live as long as Pakeha, have the same employment rates as Pakeha, earn as much as Pakeha, have the same qualification rates as Pakeha, etc, etc and yes, have their poetry published as often as Pakeha (and this post was specifically about who gets opportunities to be published, not about poetic expression, which I suspect is a lot more evenly distributed across the population). From a purely selfish perspective, I enjoy reading poetic voices that are different from mine and that express different worldviews from mine and I think a nation’s published literature should be inclusive of the different voices within it. As for pie charts, I like making pie charts. It’s a valid creative outlet and I shan’t stop.